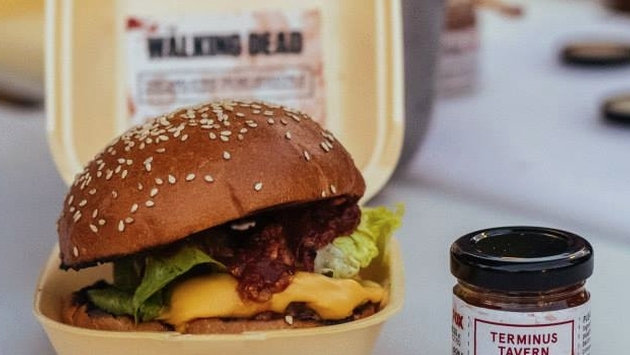 Jim Thomlinson invented human flesh burgers even The Walking Dead’s walkers would love. If they, you know, had the ability to feel love or admiration for anything other than walking slowly and eating people. NPR’s Alison Bruzek reports on the freelance chef fully embracing FOX International Channels request for something that would appropriately tout the upcoming fifth season of the hit show The Walking Dead. Appropriate, in this case, was human-flesh hamburgers. Of course, cannibalism is thankfully frowned upon in society, so the burgers don’t actually have any humans, zombie or otherwise, in it. What they do have is a delicious mix of meats that were selected to give the sensation of human flesh. We don’t write that flippantly, because Bruzek reports Thomlinson did his homework, fashioning a recipe from accounts of real-life cannibalism. America’s favorite show about zombies is hitting the U.K. on Oct. 13. To get the word out, producers flagged down Thomlinson and colleague Emma Thomas who serves as creative director for Miss Cakehead. Now, like we said, Thomlinson went above and beyond for these burgers. Where others would have used turkey or some other meat and called it a day, the chef reportedly read accounts from William Seabrook who once ate human flesh, Japanese cannibal Issei Sagawa and accounts from which the 1993 film Alive was based. Now you have the proper tools to make the upcoming season of The Walking Dead a truly delicious and, well, disturbing endeavor. While the above burgers were made available to 250 lucky souls at a London pop-up on Tuesday, the recipe should suffice for the truly curious. If you are into that sort of thing of course.